They do not belong to any political party and aged between 25 and 32. 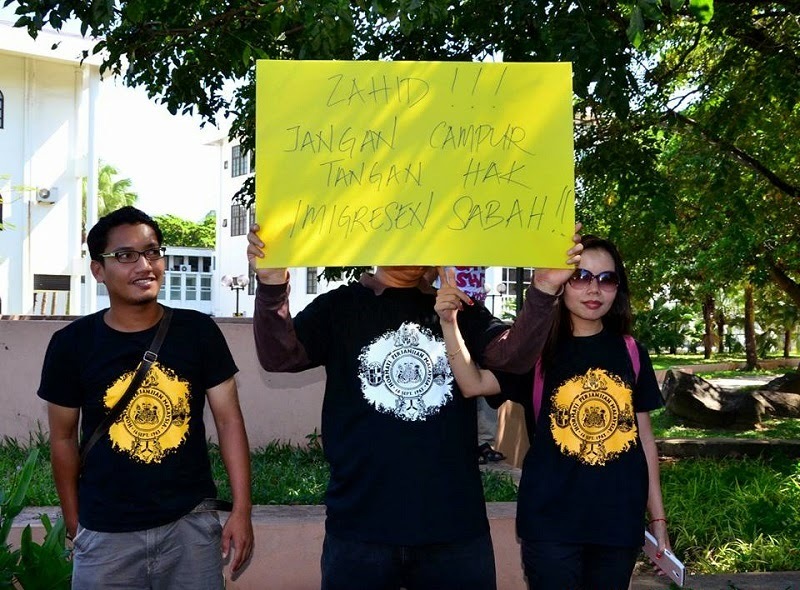 The four men who were charged with sedition in Kota Kinabalu last Monday are now the face of young Sabahans who are taking the mantle of fighting for what they believe to be the state's lost rights in the Malaysia Agreement. The four are now contesting the charge that they were in possession of materials urging Sabah and Sarawak to leave Malaysia when arrested at the Tuaran Sunday market on February 1. They are Azrie Situ, 25 and Jemmy Liku Markus Situ, 32, unemployed; Erick Jack William, 29, a mechanic; and Joseph Kolis, 29, a tour guide. “That's the trend in Sabah now,” Sabah Progressive Party (SAPP) president Datuk Seri Yong Teck Lee told The Malaysian Insider. The former Sabah chief minister attributed the trend to a growing awareness among young Sabahans of their state's history. “The history they are beginning to learn now is not found in our school textbooks. What they have found is a continued and flagrant disregard by the (federal) government of the Malaysia Agreement,” Yong said recently. He said it was this awareness that had turned into anger and resentment and the need to fight for what should rightfully be theirs. “While in the past, the government could feed the people with what only information they want to give because they control the TV and radio, they find it increasingly difficult now in the age of the Internet. Barisan Nasional MP for Kalabakan Datuk Seri Abdul Ghapur Salleh when warning Putrajaya to take care of Sabahans in Parliament on Monday, lent credence to Yong's claim when he said Sabah youth, including his children, do not read mainstream newspapers because it was perceived as pro-government, and so turned to the online news reports instead. The four were among nine people – dubbed the "Tuaran 9" by local media – rounded up by the police at the market. While four were charged and released on RM20,000 bail in one surety each, the other five were released on police bail, uncertain if they, too, would be charged. Reportedly, there were “many more” young people who had gone to the market to what they claimed was a “signature collection campaign” to force Putrajaya to honour the Malaysia Agreement. “Is it seditious to solicit signatures to demand the federal government review the Malaysia Agreement?” asked Joseph. “The police are claiming that we are members of SSKM (Sabah, Sarawak Keluar Malaysia or Sabah, Sarawak to secede from Malaysia in English). “How can that be when SSKM is a Facebook page? How can we be members of a Facebook page? It is not even an NGO,” Joseph said. He said their arrest and subsequent charge in court was “police harassment” against those who clamour for a review of the agreement, a claim that is supported by a former BN assemblyman Datuk James Ligunjang (pic). “We are not secessionists and have never fought for secession,” Joseph said. “All we want is for Putrajaya to honour the Malaysia Agreement and give us the autonomy as an equal partner state in the federation. “We are fighting for autonomy, full autonomy. Not secession. Joseph said if police had not harassed them, “we could easily get 300,000 people” to sign the petition for a review. “Easily, among young people in Sabah,” he said. Ligunjang, who has since given up on BN politics and has gone full time as a social activist drumming support to press Putrajaya to honour the Malaysia Agreement, said he, too, had been harassed by the police over his work to get Putrajaya honour the agreement. He claimed police last month seized and confiscated about 31 T-shirts with the words “Hormati Perjanjian Malaysia” (honour the Malaysia Agreement) from him in the town of Lahad Datu. The manner the police charged the four in court was also questioned. Yong, a lawyer, is questioning why the charge sheet was on that of “Mahkamah Tanah Melayu” when it should be on the Mahkamah Borneo form since Sabah and Sarawak courts come under the Borneo court. At the same time, the four asked why the police informed them of their court appearance by handing them a scribbled note. “Don't they have proper notice?” Jemmy, the oldest of the four, asked. – March 22, 2015.